Chris Young’s latest offering I’m Comin’ Over has a good mixture of subject matters, which makes it a very enjoyable album to review. The album opens with Heartbeat, a moderately paced song discussing the fact that he is so in love with his girl. I like the musical phrasing of the song it is very contemporary, one could argue almost classic considering direction country music has taken over the last few years. I think it’s a great opening track. The title track of the album is the second track. This track has a real romantic feel to it, the theme of the song being that Chris is desperate to see his girlfriend. Listening to the song, I thought it would be a perfect track for the classic romantic movie scene. It would be used in the scene, where the main couple are thinking of each other but are for whatever reason separated, and longing to be reunited. Duets in country music are for me, one of the main attractions of country music. In Think of You Chris duets with Cassadee Pope. A name I haven’t heard of but I might well look into after hearing this track. I liked how each artist was given half a verse to themselves and then they united to create a lovely harmony. The song seems to be about the fact that everyone in social situations is asking Chris where his partner is because I’m guessing they have broken up. You Do the Talkin’ is a traditional modern country song about being in love. It is about travelling around with your partner. Listening to it, it does sound like a good driving song. I Know A Guy is a country shuffle, that is perfect for a slow dance. Chris’ voice suits slow ballads with that warm tone he possesses. The song is about upsetting the one you love and wanting them back. 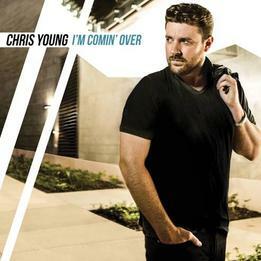 After listening to half the album Alone Tonight sounds like a standard Chris Young song. It is in his style and is about wanting someone. It is a good song, but if I were to be critical, I would say it doesn’t add to much to the album. As I write this review it is very cold outside, Sunshine Overtime is a country summer song in which Chris says sometimes you need some sunshine, and to go to the beach now. Knowing how cold it is out there that sounds like a jolly good idea! Sober Saturday Night is a ‘missing your ex’ song. Vince Gill duets on the chorus of the track and it is nice to hear an all male duet as a change to the traditional male/female duets. Underdogs has a bit of a rocky feel to it, which is something you wouldn’t expect from Chris, and is a pleasant change. As the lyrics say “Here’s one for the underdogs” which sums up the subject matter of the song perfectly. Calling My Name is another Chris Young style country song. It discusses the fact that the way a girlfriend/wife acts sometimes is like she’s calling your name. A very clever way of articulating that feeling I thought. One of my favourite songs on the album. The album ends with a slow burner of a song, that allows Chris to show off his voice. What if I Stay is a song that discusses that well experienced situation when a couple are together, one has to leave and neither of them want that person to do so. It is a fine mellow and romantic song to end on. I thoroughly enjoyed reviewing this album, and it is a great album to listen to, with something for everyone. Chris’ voice is arguably very distinctive and this album highlights that. I like the fact that the album was not just about him, and he brought both well known and new artists into the mix. In short it is a very good country album.